Online advertising allows you to reach many of your most valuable potential audiences. With Google AdWords, you can reach people who are actively looking for the solutions you provide. Social media advertising allows you to you reach people who are highly likely to be interested. 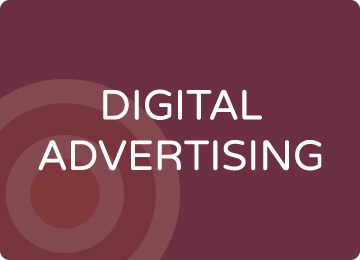 Today’s digital ads can be targeted by location, age, gender, income level, interests, time of day, and many other factors. The advertising experts on our team can hone every element of your AdWords, display, or social media advertising campaigns to ensure maximum return on your investment. We provide data-driven keyword strategies, sophisticated audience targeting, compelling and carefully tested ads, close attention to PPC costs, and landing pages that are designed for conversion. Where Does Online Advertising Fit in Your Marketing Strategy? Sure, it would be great to show up naturally at the top of Google results for the searches you want to capture. But, for many keywords, organic search rankings are extremely competitive. And, look at Google: ads dominate the top of many search results—from text ads to Google shopping images. If you want to land some of that valuable online real estate, PPC ads can get you there. But, you want to be strategic with your ad spend. We can help make sure that your campaigns deliver strong ROI. For many clients, we recommend integrating SEO and advertising strategies, because they reinforce one another. Similarly, social media, advertising can enhance the work you’re doing to connect with people organically, can help you grow your base of followers, and reach them more frequently and effectively. PPC (price-per-click) advertising can be technical and complex. But the advertising experts on our team are fluent in every step of this process—skillfully planning and executing campaigns associated with Google AdWords and other PPC platforms. We also provide full-service PPC management. This includes keyword research, ad creation, and continuous optimization to ensure that your campaigns are driving qualified traffic to your site. If you’re managing your own PPC ads, our team can provide consulting, coaching, and training to improve your results. Did you know that most nonprofits qualify for Google Grants? That means they can advertise on Google for free—yes, free—but many aren’t taking advantage of this opportunity. At JB Media, nonprofits are an important part of our client base and we’re experienced in managing Google Grants on their behalf. We can help you apply for the grant, design effective campaigns, and carry them out. Why not seize this opportunity to engage people who are already interested in what you do? The truth is, on social media, organic reach will get you only so far. Advertising can help you go further. All the major social media platforms now offer sophisticated advertising tools. When you know how to use them—or work with professionals who do—these tools allow you to run highly targeted and cost-effective campaigns. You can discover new audiences that care about your field of work. You can target your existing email lists and website visitors, including remarketing campaigns. You can promote blog posts, videos, products, or any other type of content. And, you can send potential customers or followers to your website.